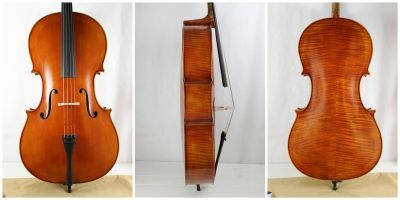 Each instrument is personally selected, fitted with Larsen strings and set up to a very high standard by Anthony Nickolds in the workshop.Handmade and hand varnished workshop cello. Stradivari model.Two piece back in figured maple, the table of even grained spruce and the varnish of a rich reddish-brown colour.Ebony fingerboard and fitted pegs.Fitted French Aubert cello bridge.Smooth action endpin with brass key.Metal alloy tailpiece with four integral adjusters. Fitted with LARSEN strings.